Thunder Cove is an unlockable race track in the game Diddy Kong Racing DS. Along with Meandering Mount, Splashdown Pass, and Strangled Shrine, it appears to be on Donkey Kong Island. Thunder Cove has what seems to be regular jungle with several trees and a short, bridged area of water. The course seems to be based off of the jungle and treetop levels in Donkey Kong Country. The course starts off with a few windy turns. Then, the racers go through a giant, wooden log, which then widens in a split path with a giant rock in the middle. After the split path, the racers then enter a giant, eerie cavern. The cavern consists of a dark colored wood with moss growing on parts of it. After they exit the caverns, the drivers enter a huge forest-like terrain with a couple bridges leading over some bodies of water. Then, they go through another dark colored wooden cavern with moss. After that tunnel, the racers enter a field-like terrain, with a huge tree slightly to the right. Next, the racers drive underneath a big log being held up by two large rocks. Shortly after, there are some more windy turns that lead back to the beginning for the next two laps. It can only be unlocked by being bought from Taj in his tent. 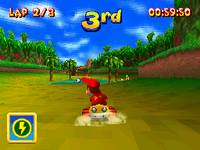 The track wasn't featured in the original Nintendo 64 version of the game.